Mahalakshmi Corporate Working Womens and Ladies Hostel in Velachery & Guindy, We providing good facilities for working womens hostel in velachery and guindy | ladies hostels in velachery and guindy. 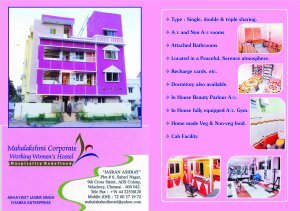 Our hostel is situated at clean and pollution free environment. We provide safe and secure living hostel room for working womens and students. Rooms: A/C & Non-A/C Delux Rooms with Luxurious Bath Fitting with 1-3 Sharing. …expected rent would be 4-5K. Pls. contact me @ 8754482634. Thanks.